Welcome to the chair for database systems! In research and teaching we focus on the implementation and efficient use of database management systems. In particular we work on in-memory databases and the improvement of our main memory RDBMS HyPer. Bernhard Radke and Thomas Neumann win the Best Paper Award at BTW for their paper LinDP++: Generalizing Linearized DP to Crossproducts and Non-Inner Joins . Viktor Leis receives the IEEE TCDE Rising Star Award for his contributions to main-memory indexing and database architectures for NVM. Our paper "No False Negatives: Accepting All Useful Schedules in a Fast Serializable Many-Core System" was accepted for ICDE 2019. Our group presents three research papers at CIDR 2019. Viktor Leis wins it all! The ACM SIGMOD awarded him the Jim Gray Doctoral Dissertation Award for his work on "Query Processing and Optimization in Modern Database Systems" and the Best Paper Award for his paper "SuRF: Practical Range Query Filtering with Fast Succinct Tries". The paper "Adaptive Execution of Compiled Queries" by André Kohn, Viktor Leis and Thomas Neumann received the Best Paper Award at ICDE 2018. Our group contributes five papers to this years SIGMOD conference and — as last year's winner — organizes the SIGMOD Programming Contest. The chair for database systems will present three research papers at ICDE 2018 in Paris. Our paper "Adaptive Optimization of Very Large Join Queries" was accepted for SIGMOD 2018. Linnea Passing and Andreas Kipf presented their work at the 17th HPTS Workshop. Jan Böttcher, Moritz Kaufmann, Timo Kersten, Andreas Kipf (Team OZero) are the winners of the ACM SIGMOD Programming Contest 2017. 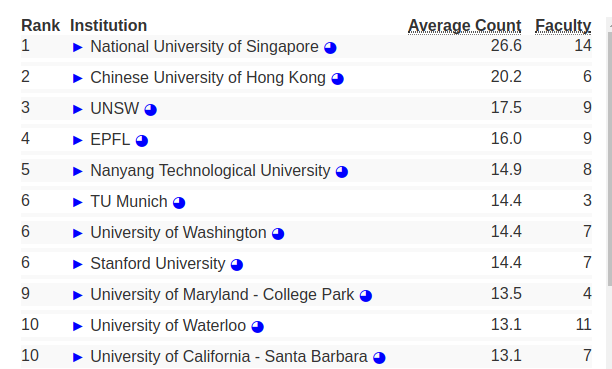 The data base group of TU Munich is in the top ten (rank 6) according to the worldwide Computer Science Ranking. Open Positions: We have openings for (fully funded) PhD students as well as for post-Doc positions. If you have a strong background in database systems (engineering) we invite you to contact us. Dr. Viktor Leis received the DBIS Dissertation Award 2015/16. Our paper "Automatic Algorithm Transformation for Efficient Multi-Snapshot Analytics on Temporal Graphs" was accepted for VLDB 2017. Prof. Thomas Neumann was awarded an ERC Consolidator Grant 2016. The chair for database systems will present three research papers at EDBT 2017 in Venice. Prof. Kemper and Prof. Neumann are co-coordinators (with Kai-Uwe Sattler and Jens Teubner) of the DFG Priority Programme Scalable Data Management for Future Hardware. The demo "High-Performance Geospatial Analytics in HyPerSpace" by Varun Pandey, Andreas Kipf, Dimitri Vorona, Tobias Mühlbauer, Thomas Neumann and Alfons Kemper won the Best Demo award at ACM SIGMOD 2016. The chair for database systems will present three research papers at VLDB 2016 in Delhi. The 43rd International Conference on Very Large Data Bases VLDB 2017 will take place in Munich and is organized by the TUM Chair for Database Systems. The Chair for Database Systems organizes the workshop Databases in the Cloud 2016. Prof. Alfons Kemper was awarded the title GI Fellow by the German Computer Society "Gesellschaft für Informatik, GI". New master's seminar held by Stephan Günnemann about 'Data Science in the Era of Big Data'. Application deadline mid of May; the seminar will be held as a block seminar, either at the end of the lecture period or during the semester break. Our group presents three research papers at VLDB 2015. BTW 2015 Best Paper Award for Thomas Neumann and Alfons Kemper: "Unnesting Arbitrary Queries"
Three of our research papers were accepted for TKDE, SIGMOD 2015, and VLDB 2015. After winning the 2014 competition, the chair for database systems organizes the SIGMOD 2015 Programming Contest. Prof. Alfons Kemper organizes the Demo Track of VLDB 2015 and co-chairs the program committee of ICDE 2016. VLDB 2017 will take place at TUM and is organized by Prof. Alfons Kemper and Prof. Thomas Neumann. ICDM 2014 Best Paper Award for Samuel Maurus and Dr Claudia Plant. Details (German). Our novel approach to speed up multiple parallel breadth-first searches (BFS) in graphs was accepted for VLDB 2015. A preprint of the paper is available. Thomas Neumann receives the prestigious VLDB Early Career Research Contribution Award for his significant contributions in the field of "High-Performance Database Engines". Moritz Kaufmann, Manuel Then, Tobias Mühlbauer and Andrey Gubichev (Team AWFY) are the winners of the ACM SIGMOD Programming Contest 2014. Started blog by and for database architects: http://databasearchitects.blogspot.de. Two research papers and one demonstration accepted for the ACM SIGMOD 2014. Short biography of Prof. em. Rudolf Bayer published. 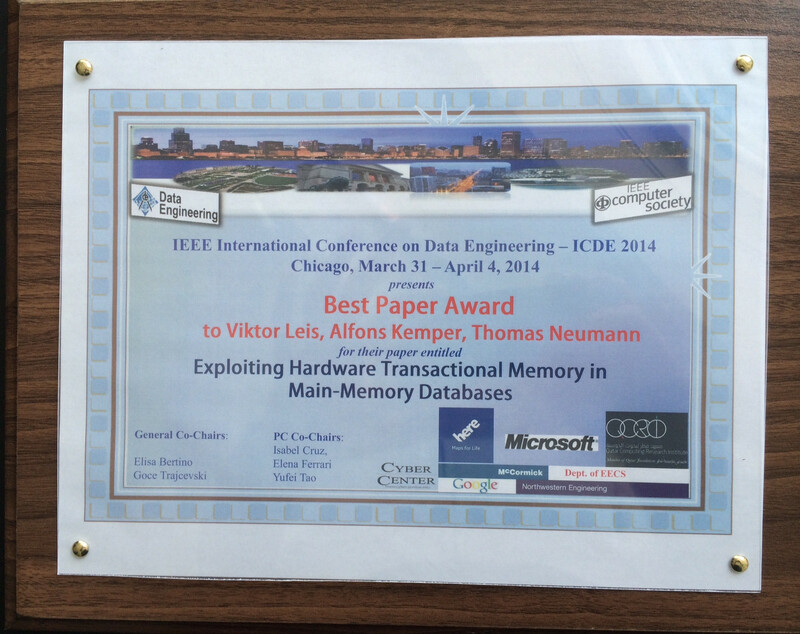 ICDE 2014 Best Paper Award for Viktor Leis, Alfons Kemper and Thomas Neumann: "Exploiting Hardware Transactional Memory in Main-Memory Databases"
Prof. Kemper and Dr Ippokratis Pandis (IBM Research) organize the ACM SIGMOD workshop DaMoN 2014. Dr. Peter Boncz received the prestigious Humboldt Prize to collaborate with our group. Congratulations to Peter! The group is part of the Linked Data Benchmark Council (LDBC), a joint project of database software vendors and academics.